Charter a yacht and sail in the Dodecanese islands. On the southeast Aegean sea, a few miles away from the Turkish coast, the group of the Twelve Islands, called the ΅DodecanisosΆ in Greek, form a line. The Dodecanese islands, each one different from the other, are an excellent cruising area and offer to the sailor the pleasure of cruising and swimming in the crystal waters of the south-east deep blue Aegean sea and discovering the numerous monuments and the history of these islands. Sailing yacht bases are situated in Rhodes and Kos, two islands easily accessible with direct flights from several European airports. Rent a boat and you can start from there your cruise through the Dodecanese. Suggested itinerary for one-week charter from Kos: Kos, Kalimnos, Gaidaros, Arki, Patmos, Leros, Kos or Kos, Nissiros, Tilos, Chalki, Rhodes, Simi, Kos. Suggested itinerary for two-week charter from Kos: Kos, Leros, Patmos, Amorgos, Skinousa, Ios, Folegandros, Santorini, Astipalea, Tilos, Chalki, Simi, Nissiros, Kos or Kos, Kalimnos, Gaidaros, Samos, Fournoi, Patmos, Leros, Nissiros, Chalki, Lindos, Rhodes, Simi, Tilos, Kos. 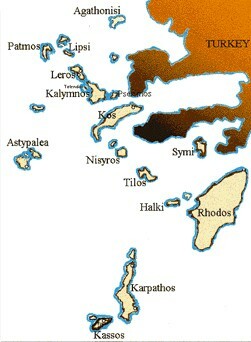 Suggested itinerary for one-week charter from Rhodes: Rhodes, Simi, Kos, Kalimnos, Nisyros, Tilos, Chalki, Rhodes. Suggested itinerary for two-week charter from Rhodes: Rhodes, Simi, Kalimnos, Leros, Lipsi, Patmos, Donoussa, Amorgos, Astipalea, Kos, Nisyros, Tilos, Chalki, Rhodes.